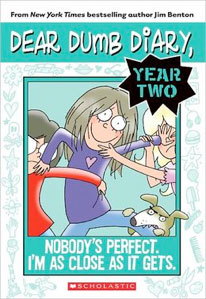 Dear Dumb Diary - Year 2 - Book 3 - Nobody's Perfect. I'm As Close As It Gets. Home > Dear Dumb Diary > Dear Dumb Diary - Year Two #3 - Nobody's Perfect. I'm As Close As It Gets. Dear Dumb Diary - Year Two #3 - Nobody's Perfect. I'm As Close As It Gets. Sneak a peek inside the diary of Jamie Kelly, who promises that everything she writes is true... or at least as true as it needs to be.